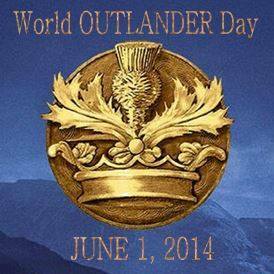 Help spread the Outlander love on Twitter and Facebook for ‪#‎WorldOutlanderDay‬ this Sunday, June 1st. Outlander fans are being asked to change their profile pics on FB and Twitter to something Outlandish for the day and to tweet book quotes, photos, memes and video links from 6-7 pm in their respective time zones. Roc Lyn has kindly edited the list below of copy-and-paste quote tweets based on a list created by Kristin Deborah Matherly for our #WorldwideTvNeedsOutlander effort in January. Theresa at Outlander Kitchen has come up with some awesome and creative ideas on how to celebrate the day too—I highly recommend checking them out! Personally,I will be changing my profile pic & drinking wine from a glass with Outlander wine charms on the stem, made by Book Beads. (I do what I can). And I will toast you drinking your wine out of a glass with Book Bead charms! Slainte, my Outlander friend.